But Jake is such a darling little boy! And he's already captured her heart. What does she have to lose? If Sam's work keeps him on the road enough, she won't have to deal with him much at all. Maybe this just might work. All Sam du Cannon wants is a good mom for his son. He's had it with women. Doesn't ever plan to get involved with another woman again. That makes Nella perfect for him. He's never been overly attracted to plus-size women, so if Nella agrees to marry him, he won't have to worry about being tempted to have a relationship with her. As they lay exhausted from making love, Sam said, "You are, without a doubt, the most passionate woman I have ever known. And you turn me on more than any woman ever has." Not knowing what to say, Nella just reached up and lightly kissed him. "You ain't seen nothing yet," she whispered her promise. Soon they both drifted into a contented sleep. "Nobody's Perfect is an engaging novel about a marriage of convenience—or is it? A 'plus-sized' woman needs to keep her childhood home, and a fairly egotistical man has had it for relationships, and just wants a mother for his son...a mother that, he hopes, he will not be physically attracted to and with whom he will not be tempted to share a relationship. Or so he keeps telling himself, but life and human hearts have unpredictable surprises in store, in this charming, witty, and tender love story with a twist." "...once I started reading it I couldn't put it down! I loved it! It's so nice to read about a woman who isn't 'a perfect size six, and on the slender side' like so many of the other books I've read, or have her be a little heavy at the beginning of the book only to lose the 'excess' weight once she finds a man. Being a full-figured woman myself, I hope you start a new trend of books being written for real women! Keep up the great work!" "I love how your heroine was a strong woman who felt comfortable in her body no matter what size she was. I hope you keep writing, because you have a talent that I envy. I hope to hear and read more from you." "A Plus Sized Heroine! Yeah! Well, first off I must say a big thanks to Pat Ballard for giving us a heroine who is plus-sized and loves herself. It's not often we see one, so it was very refreshing to find one in this book. This is the first book I've read by this author and it won't be the last. It's a quick book. You can finish it in an afternoon. The story is easy to follow and filled with excitement and love. I really enjoyed this story. The author makes it quite clear that being a plus-sized person doesn't mean that you are unhealthy, stupid, or unlovable—it just makes you human." "Ballard's Nobody's Perfect Near Perfect. Nella is so kind, beautiful, strong, and loving, the reader falls in love with her immediately. The fact that she is 'plus-size' is dealt with in such a manner that her being big is, indeed, a plus. 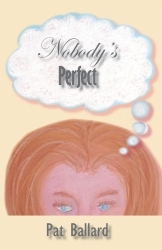 In Nobody's Perfect, Ballard has created a heroine who has learned to love herself despite living in a society that inundates us with the message that thin is better. Ballard addresses stereotyping without preaching. Very quickly, size is no longer a character in this fun, fast-paced romance that the reader will love." "I just wanted to let you know that your books have changed my life in a matter of days. See, I received a Kindle for Christmas... So I typed in on my Kindle plus size romance and your books popped up. In the last 2 days I have read Nobody's Perfect (1st), Dangerous Curves Ahead (2nd), A Worthy Heir (3rd), His Brother's Child (4th) and just finished Abigail's Revenge. They were all awesome. My favorite is Nobody's Perfect. I wanted you to know that you are now MY FAVORITE AUTHOR. Please tell me more books are coming. I have been over weight my entire life; I never thought that I was pretty—my husband tells me that I am, BUT until I read your books—WOW, I am telling you, life changing....God Bless you always!" The Queen of Rubenesque Romances shares the steps she created―and took―to heal the damage of years of dieting. Mobipocket ebook. Hanna must marry by her 30th birthday or she'll lose her home & inheritance. Her brother arranges marriage to the has-been rock star who was her teenage idol. Mobipocket ebook. Sparks fly the night Lana meets to plan her sister's wedding―and not just because she announces she's stopped dieting and doesn't care if she's fat as maid of honor. She attracts the attention of the groom's best man. Mobipocket ebook. One party, one silver-tongued stranger, & Faith winds up betrayed, alone & pregnant. When Edward shows up to right his brother's wrongs--& falls in love--will her battered self esteem allow her to see the truth? Mobipocket ebook. A curvaceous lab technician is threatened after seeing questionable research, and must deal with a charming LAPD detective as well as those who want her dead. Mobipocket ebook. Ten romantic tales pack suspense & sizzle into this collection of short stories all featuring big beautiful heroines--and more than one big handsome hero. Mobipocket ebook. A newspaper ad for "a worthy heir" leads a young woman to the owner of the company that fired her brother after a job injury. All Pam wants is help for her brother, but sparks fly when the handsome jilted heir returns home. Mobipocket Ebook. Injustice, romance & suspense smolder in a small Southern town. A young woman framed for her father's murder is released from prison & seeks revenge on the people who stole 10 years of her life. Mobipocket ebook.